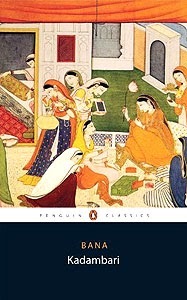 Kadambari, the romantic novel in Sanskrit, is originally known to have been written by Banabhatta. He passed away before completing the text, and the book was later completed by Bhushanabhatta, his son. Kadambari is regarded as one of the earliest novels in the world. The word Kadambari itself has evolved to mean a ‘novel’ in several Indian languages, including Kannada. Compiled by Banabhatta in the first half of the 7th century A.D., Kadambari is divided into an earlier part called Purvabhaga and the later part called Uttarabhaga. The original work has an extremely intricate plot, with Kadambari, the character herself, appearing only half-way through. One version of the novel can be found in Kathasaritsagara. The novel continues to be translated into different languages. Banabhatta was a 7th century Sanskrit poet and prose writer. He was the court poet of King Harsha Vardhana. Banabhatta’s major works include his king’s biography called the Harshacharita. He is also known to have written Candikasataka and a drama titled, Parvatiparinaya.